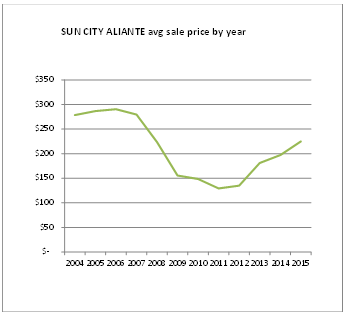 Can the resurrected planned development bring our prices back to 2006? Our prices dropped in half from 2006-2010. They rebounded significantly in 2013 and continue to increase. BUT we are only at 80% of where we were. The economy is improving. The 215 Beltway is expanding to our East and West. Shopping, schools, Aliante Hotel and Casino and the VA medical center are in place. 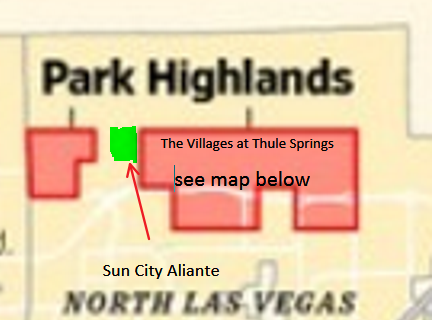 The Villages at Thule Springs to our East will include a new ACTIVE ADULT COMMUNITY. Park Highlands to our West will be traditional housing (not high density). This planned development should have a positive impact on our economy and our home prices. After being split among several owners since the project's inception, it has been divided in two: The roughly 2,000-acre Villages at Tule Springs and the roughly 600-acre Park Highlands West. 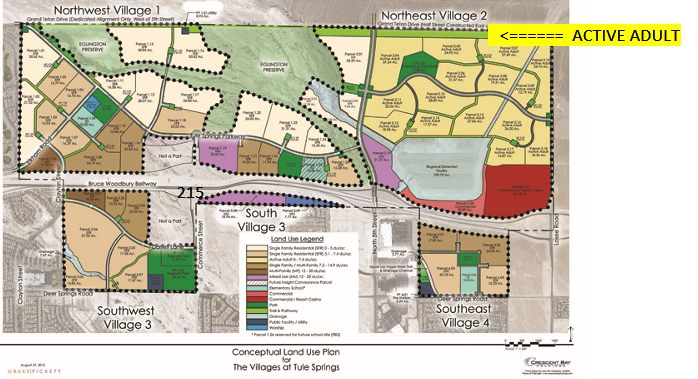 The Villages at Tule Springs, led by developer Gregg Wolin, are divided into four sections. Village One in the northwest is composed of 515 acres and is seen as the "jewel of the development," being adjacent to the Eglington Preserve. Many semi-custom and executive homes are planned for construction there. "We plan to build bigger homes and lots that North Las Vegas hasn't seen in probably my 19 years of doing this," Gronauer said. Village Two is set to focus on the active adult community, with 2,000 units deed restricted for adults 55 or older, while the remaining homes are set to be traditional homes. A clubhouse in the active adult community is planned to be highly amenitized, and it will be finalized when plans come forward for development. Developers are also looking at it as a potential site for a casino. Village Three in the southwest area is planned to have a regional park with Wi-Fi services and a police station. In order to save the city "millions of dollars a year," according to Gronauer, the parks, excluding the regional park, will be maintained by the master developer. Village Four is set to have a park, an elementary school and a fire station. In total, The Villages at Tule Springs is expected to have a $3.3 billion economic impact to the city, while Park Highlands West is estimated at more than $2 billion. The original project was designed to be high density (also known as urban development), with small lots. 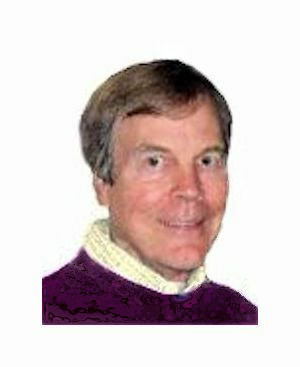 However, following a style similar to the Skye Canyon master-planned community in the northwest, Park Highlands has since been reduced to traditional housing.